Sometimes, it's nice to get a little reminder that even the world's most powerful people are just like us, right? For a good example, look no further than the launch of the Presidential Leadership Scholars program, which took place at the Newseum in Washington, D.C. Monday, headlined by a joint appearance from former Presidents Bill Clinton and George W. Bush. And it wasn't all about business — Clinton and Bush talked about grandchildren too, according to NBC News, with Bush telling Clinton he's "not going to believe" how great it is. For what it's worth, I can see the indignation coming with this one. And, to an extent, I understand — both Clinton and Bush were two-term presidents who presided over an awful lot of hard times, and are responsible for hardships in everyday people's lives, to varying extents. The Bush presidency in particular, with its multiple, poorly-executed foreign wars practically invites the reply: "What about the grandchildren of the Middle East!?" But there's a certain shared reality of being human, and raising a family, and all the thoughts and feelings that go along with it that defy that kind of cynicism. And really, the duo's appearance was anything but cynical in tone — they seem to genuinely like each other. 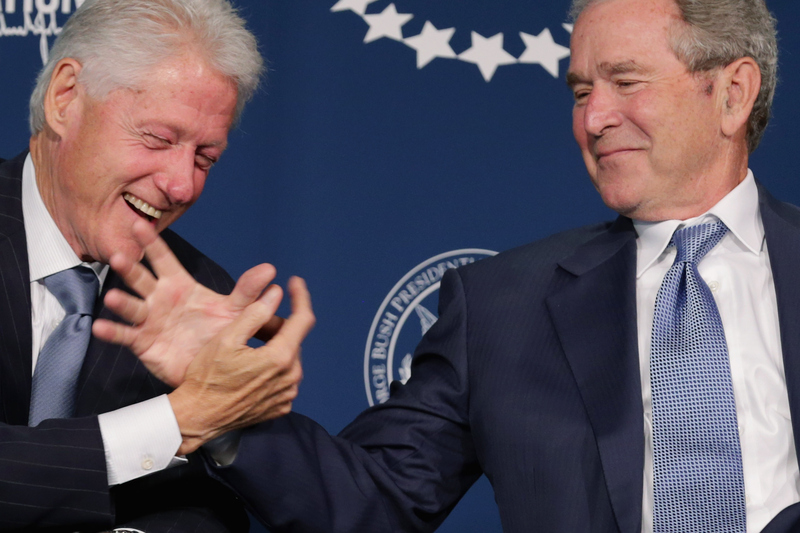 Amid all the conversation about the new scholarship fund, their legacies, and their views on one another — Bush praised Clinton's abilities as a communicator, while Clinton said he admired Bush for being underestimated while in office — Clinton pulled out his cellphone in mid-sentence, and remarked about the exclusivity of his number. Only two people have this number, and they're both related to me, I hope I'm not being told I'm about to be a premature grandfather. The introduction of Clinton's news— his daughter Chelsea is expecting her first child with husband Marc Mezvinsky, having announced her pregnancy publicly back in April — gave Bush a chance to expound on one of the few experiences he has that Clinton doesn't yet: being a grandparent. According to NBC News, he told Clinton how "awesome" the experience would be for him. Get ready also to be like the lowest person in the pecking order in your family. Be prepared to fall completely in love again. You’re not going to believe it. You’re just not going to believe the joy and the fun. And I’m looking forward to talking to you after that child is born. … It’s going to be an awesome period for you. Bush himself has one granddaughter, by his daughter Jenna, named Margaret Hager. As for Chelsea's upcoming bundle of joy, there's no name chosen yet, at least not publicly. But whatever they end up picking, you can rest assured you'll be hearing about it — being born into one of America's foremost political dynasties, after all, is a pretty high-profile thing.